As the population of Connecticut grew in the Eighteenth Century the Legislature began to split the large town tracts into smaller towns and parishes. Thus North Bolton Parish was formed from Bolton and would in 1808 become our town of Vernon. With the dividing process came the setting of boundaries in official documents. Individual properties often referred to oak trees, brooks and walls that the residents of the time understood, but two centuries later no longer exist. So too with the designation of town and parish boundaries. Farmers and other residents in the northern section of Bolton travelled each Sunday to the meetinghouse in the southern section of town. This was very difficult in winter and they petitioned the General Assembly in 1749 for the minister to hold services in Vernon Center. See 'Vernon's First Church' for more information. 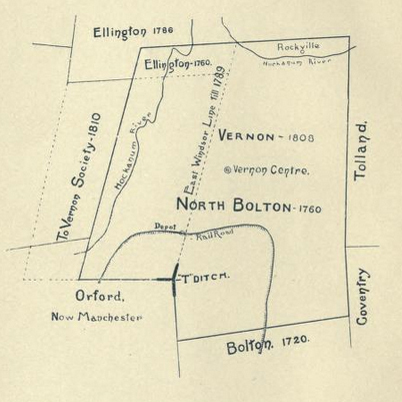 "The eighteen persons who petitioned the General Assembly for winter privileges, in 1749, describe themselves as "inhabitants of the North end of Bolton, viz., inhabiting North of a due East line drawn from the Ditch commonly called the T Ditch, cross said town. "This 'T Ditch' is often referred to. It was simply the legal landmark for town boundaries, at the East end of the line between the towns of Hartford and Windsor. Its arms marked the direction of the lines between those towns and the town of Bolton. The place is now the Northeast corner of the town of Manchester." "The territory of North Bolton Society was the same as that of the present town of Vernon. It was taken from four different ecclesiastical societies. Much the largest part of it was taken from Bolton, the Southern boundary being a line running nearly East, from a point one mile South of the 'T Ditch.' The inhabitants of this section numbered a little less than three hundred." "Upon the memorial of Moses Thrall, Charles King and others, inhabitants of Bolton living north of a due east line drawn from a ditch, commonly called T ditch, cross said town, representing that they lived at a great distance from the place of publick worship in said town, by reason of which it is exceeding difficult for said inhabitants to attend the publick worship in said town, especially in the winter seasons, and praying for relief in the premises, &c.: Resolved by this Assembly, that the aforesaid inhabitants living north of the said line shall have liberty, and liberty is hereby granted unto them, to hire an orthodox, approved minister or candidate for the ministry, to preach among themselves from the last of October to the first of May annually, and that during that time or such part thereof, and no longer, if they shall procure preaching of the gospel among them, they shall be exempted from payment of ministerial charges in the parish to which they belong. Note 'T' designation at the T Ditch. 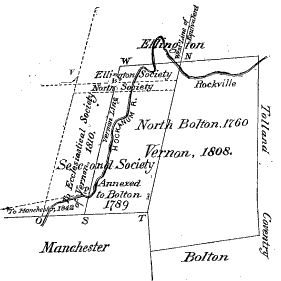 "It is thereon resolved and enacted, that the inhabitants of the north part of the town of Bolton and the east part of the town of Windsor living within the limits and bounds hereafter mentioned be and hereby are made into a distinct ecclesiastical society by the name of the society of North Bolton, and have and enjoy all the powers and privileges of other ecclesiastical societies in this Colony, and that the bounds and limits thereof be as followeth, viz: Beginning on Bolton east line at five miles distance from Bolton southeast corner, thence running northerly in said line betwixt the towns of Coventry and Tolland on the east and Bolton on the west to Bolton northeast corner, thence turning westward in the line betwixt Bolton and Ellington to Bolton northwest corner, and still continuing the same course into Ellington about a mile and half and forty rods, thence turning and running southwardly at the west end of the second tier of lots to Hartford line, thence turning eastward in said line to Bolton or the T ditch, thence turning southwardly one mile in the line betwixt the towns of Hartford and Bolton, thence eastward to the first mentioned bounds. "In the absence of any accurate maps of Vernon or of South Windsor it is somewhat difficult to define these older landmarks. The Hartford lines were until 1842 the boundaries of Manchester and the T ditch is at the northeast corner of Manchester. The part taken from Windsor seems to have been a rhomboid its longer sides being the present west line of Vernon and a parallel line running from the re entrant angle in the southwest corner of the town The line of Windsor, afterwards East Windsor, used to pass within sixty or eighty rods of the site of the present meeting house at Vernon Center." Today the 'T Ditch' marks the northeast corner of Manchester with Vernon. There is indeed a narrow waterway roughly following the northern border of Manchester which might be described as a ditch. There may be another following the boundary south. 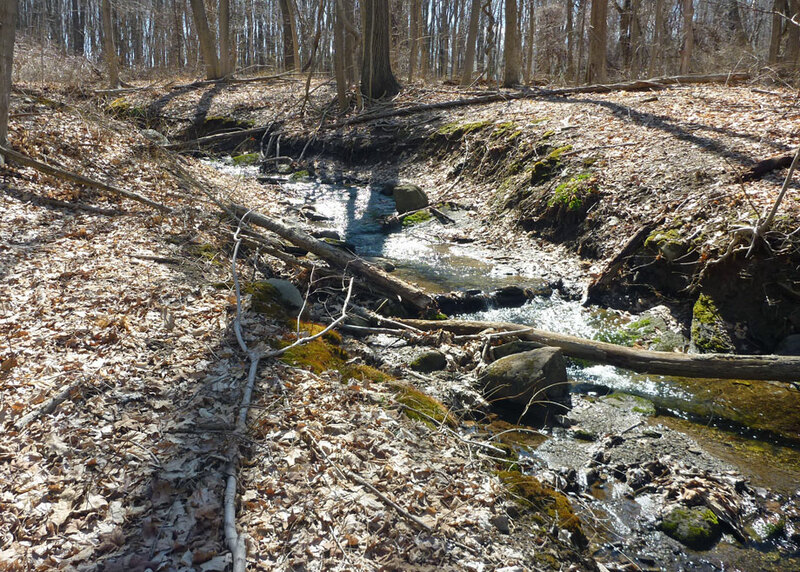 They lead to Tucker Brook which joins the Tankerhoosen River just above the Dobsonville Pond dam. 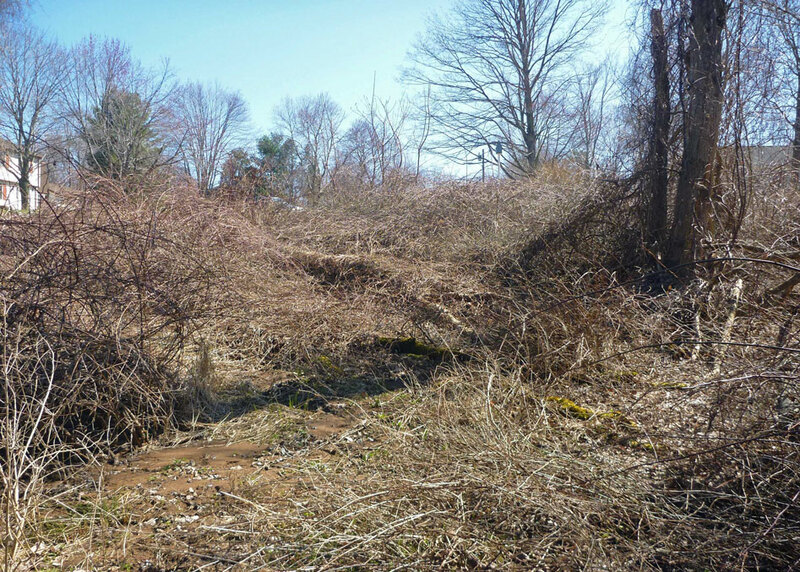 The area is overgrown with invasives and may be a Manchester Open Space parcel. I also understand Vernon ran its sewer lines here to avoid the hill on Lake Street. 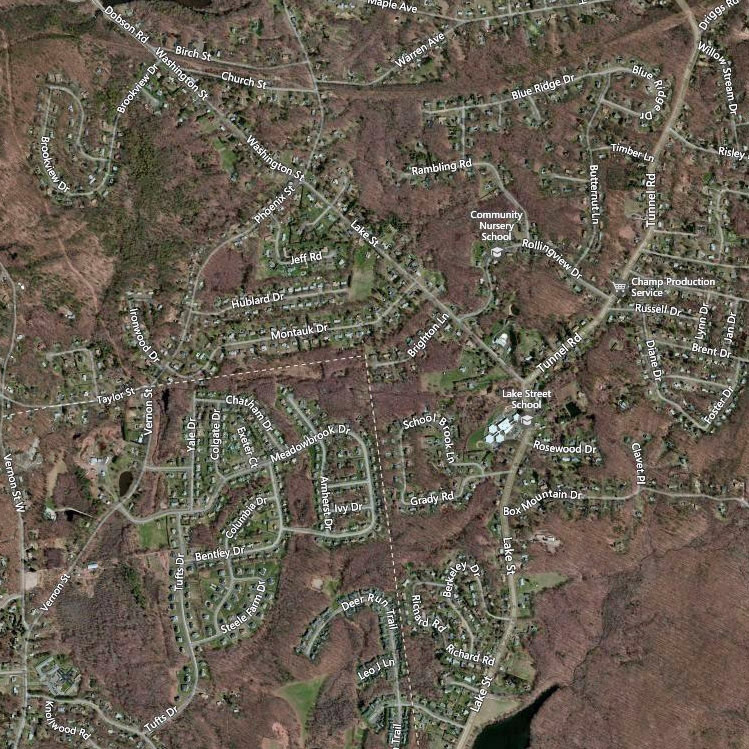 The closest access point is the cul-de-sac at the end of Vernon's Brighton Lane off Lake Street. To satisfy my curiosity I visited the location in April to see if there were any significant features and to try to locate the corner marker or pin. From the cul-de-sac you descend an embankment, which could be the result landscaping for the Brighton Lane homes. However, just to the south along the embankment is a rock outcrop, so perhaps the bank too is a natural feature of the landscape. A little further south Tucker Brook runs east to west cutting a channel and running into a wetlands area to the west. None of these features stands out as significant landmarks. 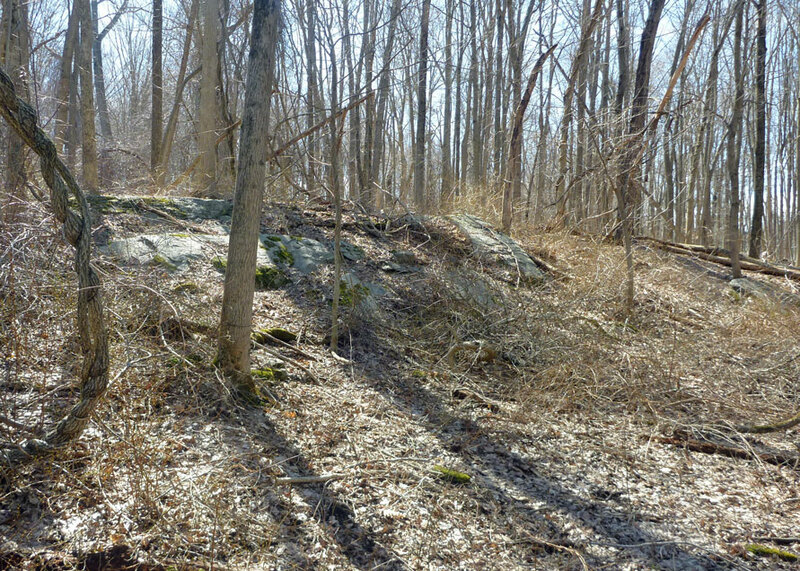 The corner where a marker might be located is at the base of the embankment. 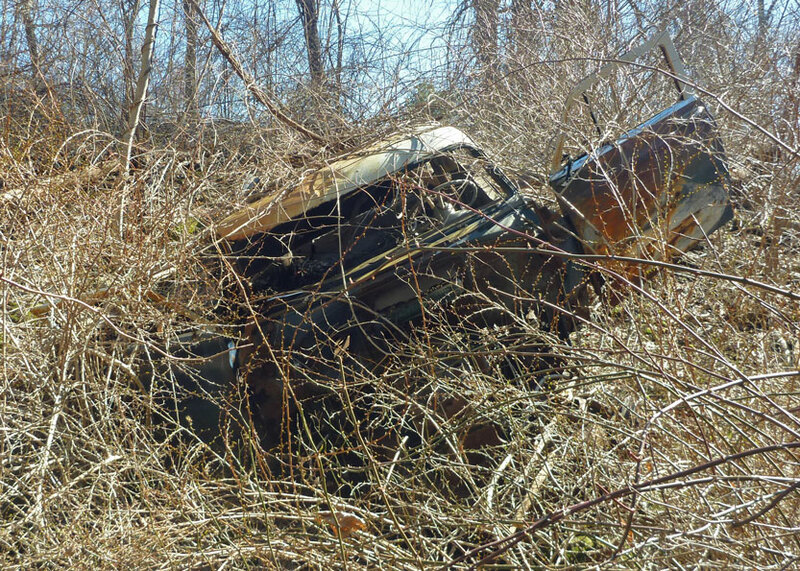 It is a combination of invasives and trash from neighboring homes, including the rusted hulk of an old car. The likely pin location was inaccessible. 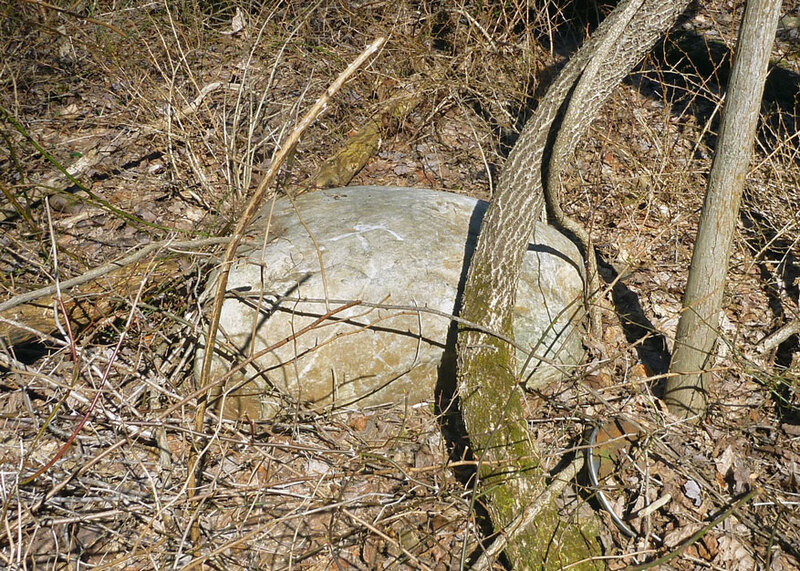 Nearby is an rock with natural markings which could be meaningful if I unleash my imagination. For lack of anything else I'll call that the corner and wonder if it was there during colonial times. Bolton historian Hans DePold says some of the corners of Bolton were marked by stone piles. Perhaps there is one under the brambles. East bank with invasives tangle. Rock outcrop on east bank. Tucker Brook carves a ditch. Wetlands to the west of the town line. Junked car on the bank near the corner. Rock close to the corner. Note the natural marking on top. What was the significance of the 'T Ditch' to the early settlers? Lake Street was likely one of the major roads from North Bolton to Bolton, but the 'T Ditch' is not connected to Lake Street. Perhaps it was the corner of some early farmer's field. The Risley family owned land in this area as shown on early Manchester maps. Why was this point recognizable to all the town fathers? What exactly was the 'T Ditch'? This is a wetlands area today. 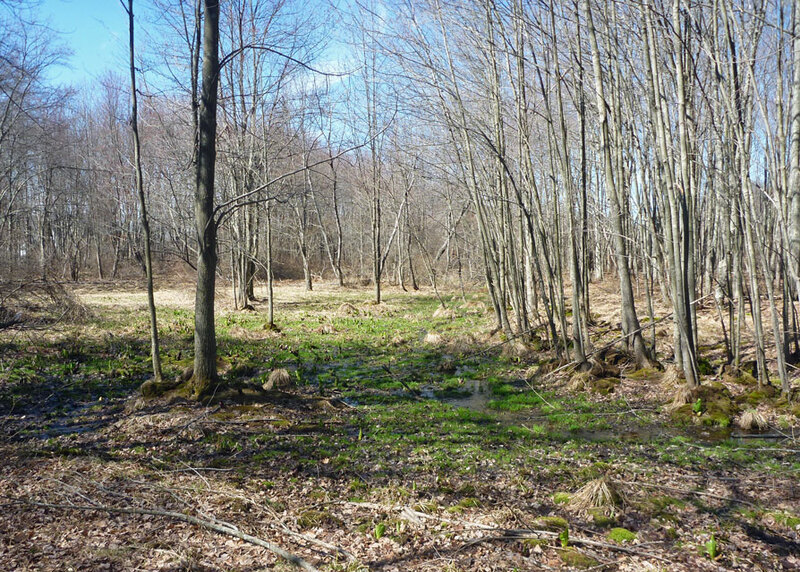 It's possible a natural rivulet was deepened and straightened to drain the land for a field, thus being described as a 'ditch.' If this was the case there may have been a cross drainage ditch forming the 'T'. This area, behind Lake Street School, is also thought to have been a Native American summer campground. Could Indians have created the ditch to drain a field for corn? From "Vernon, Our Town", page 11: "Near the Tankeroosen River where the Lake Street School is now was a famous hunting ground. An Indian summer camp was located there." Interesting speculation. Hopefully, posting this page will generate answers from area historians. "The Church of Christ In Vernon, Connecticut: An Historical Address" by Allyn S. Kellogg, 1888, 50 pages. History and memories of the First Congregational Church by Kellogg (1824-1893), grandson of Vernon's first minister. The entire text can be found and searched online. "The Public Records of the Colony of Connecticut 1744/1750, 1757/1762." Available online. "The History and Genealogies of Ancient Windsor, Connecticut", by Henry Reed Stiles, 1891. See pages 557-559, includes map. Also online. "Vernon, Our Town" from the Vernon Historical Society, 1989. Although written for school children this is a good overview of Vernon history. Chapter 2 is titled 'Vernon's First Inhabitants' on Native American's presence here.